Electromagnetic Frequencies (EMF) are so real. They are given off by electronics such as computers, TV’s, cell phones, microwaves, etc. The electromagnetic smog has quite a few negative effects on our bodies including fatigue, memory loss, decreased attention span, difficulty focusing, headaches, depression, anxiety, irritability, insomnia, joint and muscle pain, and weakened immune system. I recently got some black tourmaline in my life and I really notice a difference. Tourmaline in general cleanses, purifies, and transforms dense energy into a lighter vibration. 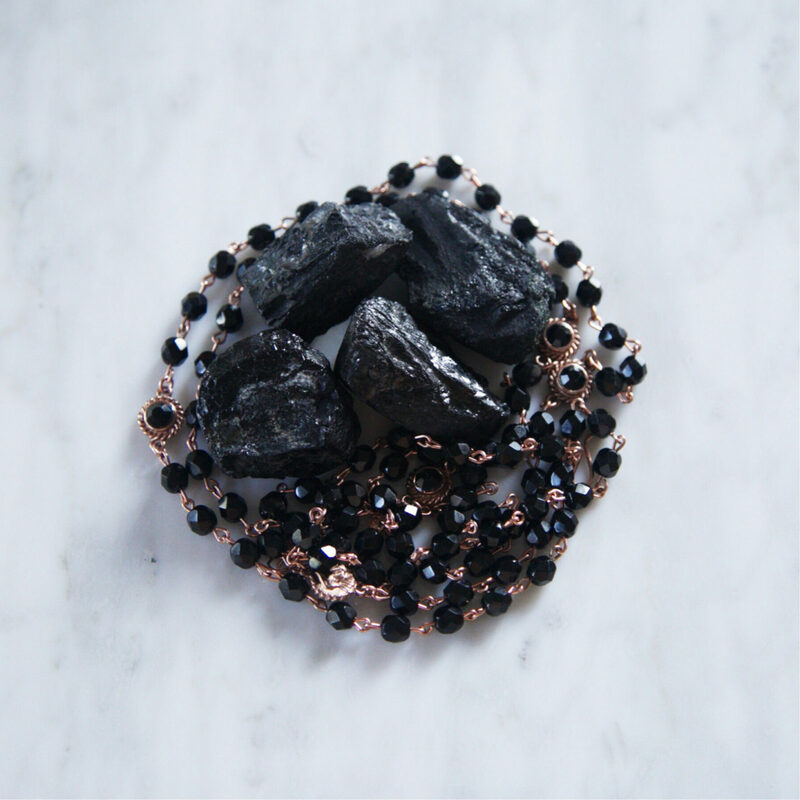 Black Tourmaline protects against cell phones, electromagnetic smog, radiation, psychic attack, ill-wishing, and negative energy of all kinds. It connects with the base chakra, grounds energy and increases physical vitality. It disperses tension and stress, clears negative thoughts, and encourages a positive attitude. Black tourmaline defends against debilitating disease, strengthens the immune system, treats dyslexia, arthritis and more… Not bad for $20. You can easily get some at your local crystal store or even on amazon. Place your crystals in between you and the electronic device or wear around your neck. It also helps to unplug your wifi and TVs at night and turn your phone off or at least put it on airplane mode. Get outside a lot too! Let’s all make a collaborative effort to be better people for mankind! Yes, I got a piece of moldavite recently. I usually keep it in my bag. Thanks for your comments! Another cool stone – well its actually an infused meteriote comet green Lava then green glass droplets that have been around for over a million years, having a texture that sometimes is reptile like, and sometimes in perfect geometric continuity and harmony – it’s moldavite, and interestingly, the moon charges it, and that is the affect that I feel from your awesome blog and modeling career, oh yeah – I have had this moldavite thingy around my neck since I moved from Enicinitas right near moon light beach, about 2 years ago..now I’m in Florida, hurricane capital of the world …. aka scorched earth, ha ha ha….lightworkers are needed wherever it seems that I find myself…going to Austin Texas today…wondering why all the hotels are booked up. Must be from the election – go Hilary!! Cool 🙂 Stones and Crystals are cool and inexpensive, better than cheap, fake jewelry! There was a show on a couple of years ago called “celebrity ghost stories” and I remember the psychic host was trying to help the actress fairuza balk clear some oppressive spirit in her house or I think it was a loft in Hollywood. By the time she brought out a big chunk of black tourmaline, to clear the house of this evil entity, I was convinced – as a viewer, that they were all telling the truth. Well something knocked the black tourmaline off of the tray that the psychic had it on, and it hit the floor and broke into pieces. So the standing orders were, that fairuza was just to leave the mess on the floor, because somehow the evil entity did not like it. That is just an interesting tidbit I picked up while watching the crazy shows that most people dismiss as fake, I think there is a lot to learn from it – like the amazing powers of protection that black tourmaline has!!! I can vouch for it on a personal level too, it’s what I wear when I’m sensing an attachment of something – it’s hard to explain, but it’s a really good powerful stone i.e. piece of the Earth! !